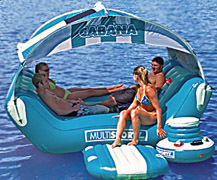 Our full line of boat props offered at the lowest prices. 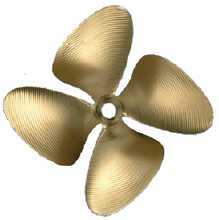 boat propellers because of our deep discount prices and fast, expert service. 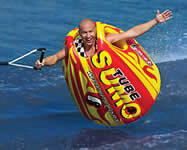 We sell the best brands of boat props for most makes and models, 10 horse power and up. Same day shipping for most orders and we accept all major credit cards. improved geometry for great all-around performance. High Performance Series 40 -300 hp for 3 1/2" to 4 3/4"
these props give a new meaning to the word hustle. handling even on tight turns at wide open throttle. performance bass boats and powerful sterndrives. deliver optimum acceleration and top end speed. For all size outboards and sterndrives. Same as Mercury Black Max series of propellers but with a flat black finish and different part number. Same performance and quality, and they cost less. Silverado, lightspeed and Thunderbolt stainless steel propellers are the same as Mercury Vengeance, Laser II and Mirage Plus propellers are. Same performance/quality. Less cost. Stainless steel propellers, Same as Mercury "Bravo Three" boat propellers.They come in a Satin finish and a different part number. Buy as a set or separately. Same performance and quality.Less cost. hub system. For small to large engines. sizes for larger boats. Highly polished finish. 3 and 4 blade stainless steel props. Optimized power tip for peak efficiency. 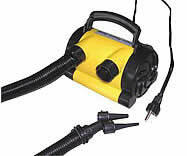 bite and reduce power losses caused by cavitation. For small to large engines. 100 years. High gloss black powder coat finish. Cushioned rubber hub. We also sell PowerTech Propellers, Deep Discount Prices. recommendations and to place an order. Hot Shot The little brother of the Turbo family. For outboards in the 18 to 70 H.P. range. Acceleration, speed and fuel efficiency is unsurpassed in the industry. 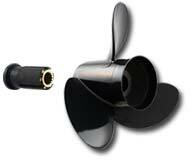 Turbo 1 An excellent boat prop choice for mid-size to large outboards and sterndrives. Outstanding overall looks and performance for medium to heavy boats. Lightning Targets the V6 and V8 outboard markets. 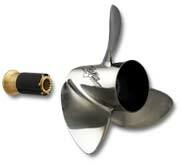 High rake and large diameter blade design give these boat propellers almost unbelievable performance. Vector Designed and developed for the Mercury Bravo One drive with big horse power. Increased blade area and diameter enhance performance and fuel economy. optimum bow lift and load carrying capacity at higher engine heights. Ultima 4 Develops lift and stability for the offshore fishing market. 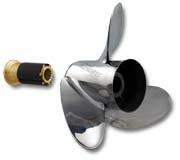 Rough water and adverse conditions are absolutely no match for this stainless steel boat prop. fast stable top end speed. For mid-size/large outboards and sterndrives. Call us for a quick price quote and to place an order. for proper replacement matching, if possible.